The Goodyear Tire & Rubber Company is one of the world’s leading manufacturers of tires, with one of the most recognizable brand names in the world and operations in most regions of the world. We have a broad global footprint with 48 manufacturing facilities in 21 countries, including the United States. We operate our business through four operating segments representing our regional tire businesses: North America; Europe, Middle East and Africa; Latin America; and Asia Pacific. 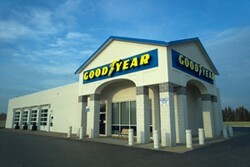 The Goodyear Tire & Rubber Company was founded in 1898 by Frank Seiberling and based in Akron, Ohio. Goodyear manufactures tires for automobiles, commercial trucks, light trucks, SUVs, race cars, airplanes, farm equipment and heavy earth-mover machinery. The company was named after Charles Goodyear, inventor of vulcanized rubber. The first Goodyear tires became popular because they were easily detachable and required little maintenance. Goodyear is also known for the Goodyear Blimp. The first Goodyear blimp flew in 1925. Today it is one of the most recognizable advertising icons in America. The company is the most successful tire supplier in Formula One history, with more starts, wins, and constructors’ championships than any other tire supplier. They pulled out of the sport after the 1998 season. It is the sole tire supplier for NASCAR series. Goodyear manufactures its products in 48 facilities in 21 countries.